We are able to take away the need for pay day loans because we get rid of the pay day concept completely. A London-based start-up called Etch is set to transform the way people are paid and eradicate the need for expensive pay day loans. Created by Welsh-born entrepreneur and blockchain specialist Euros Evans, Etch has the ability to pay workers in real time, second by second. Euros Evans and his team realised that the way people are traditionally paid is problematic. For workers who are paid monthly, it can be difficult to ensure the money lasts, and for contractors it can be hard to ensure payment. By enabling employers to pay workers and subcontractors by the second into an account that that can be checked instantly by an app and accessed via a universally accepted card similar to a debit card, Euros and the team know they can modernise payroll and make it better for everyone. Etch is the first approved ‘dapp’ (decentralised application) in the Construction Blockchain Consortium, a group of leading UK champions of disruptive technologies who are transforming the build environment. The Etch platform is raising £5million through a token sale to fund the development of the platform. Euros Evans explains, “Billions of people across the world live paycheque to paycheque, a situation that can lead to mounting debt, stress and poor health. The Etch solution enables employers to pay their employees in real time. If, for example, they don’t have any money at the beginning of the day, their morning’s work will mean they have enough money for purchases they require. “We are able to take away the need for pay day loans because we get rid of the pay day concept completely. The Etch platform means that people will no longer have to wait until a particular day to receive money in their bank account. “The system makes things very easy for workers. Imagine that you start your shift at 8:00AM. You ‘punch in’ using the app to let your employer know you’re working, and from that point money is paid into your account in a continuous stream. “At 12:00 noon, you check the app again, which shows you your account balance. If it had been empty at the beginning of the day, you’d now have four hours’ pay in the account. Your employer would have already issued you with an Etch card, where part of the earnings can be used in any shop to buy your lunch. Euros Evans is supported by a group of highly talented London-based entrepreneurs who share his vision that payroll is in need of reform. Tomasz Mloduchowski, aged 30 from Poland, is a former MIT graduate who is a near veteran in the subject of programmable currency, having worked in the sector for 8 years. Joshua Richardson, aged 22, who is from London, is a blockchain engineer and programmer who deployed his first commercial software at the age of 13. Ben Whyte, 24, a blockchain consultant and business developer, heads up the community engagement. 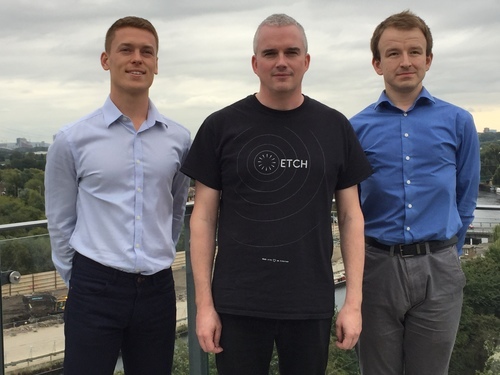 The team at Etch are passionate about governance and compliance and are receiving advice from Paul Airley, a Partner for the London-based international law firm Fladgate LLP plus Chris Mills, UK Head of Blockchain for the ‘big four’ accountancy firm, KPMG. High resolution images available on request. Euros Evans is available for interview. For further information please contact Adam Betteridge at adam@famouspublicity.com, George Murdoch at george@famouspublicity.com, Tina Fotherby at tina@famouspublicity.com or call our office on 0333 344 2341. Alternatively, please contact Etch Community Manager Ben Whyte at ben@etch.work. Euros Evans spent over 25 years in the construction industry. First, he worked as an apprentice builder with his father before studying to become an architect. Always having an interest in innovation, in 1993 he co-founded the UK’s first student accommodation website. Realising the potential of blockchain he set up N.O.M.A.N. in 2015 and built a community of 900-plus, forging strong relationships with the people who have now become key members of the Etch team. Etch is an Ethereum blockchain designed to automate payroll and use smart contracts for real-time wages and remittance. By creating the world’s first automated payroll system which allows workers to be paid in real-time, and which allows their families to benefit from real-time remittance at a fraction of the cost, Etch aims to revolutionise payroll. It will remove layers of business inefficiency and the time and cost of payroll, while improving financial security in the lives of their employees. This press release was distributed by ResponseSource Press Release Wire on behalf of ETCH in the following categories: Men's Interest, Women's Interest & Beauty, Consumer Technology, Personal Finance, Travel, Education & Human Resources, Manufacturing, Engineering & Energy, Computing & Telecoms, Construction & Property, for more information visit https://pressreleasewire.responsesource.com/about.